The story and illustrations show the readers the Korean culture, “My name is Yoon. I came here from Korea, a country far away.” It’s also about how a Korean-American girl reconciles her two worlds. More than that, the story comes up questions for every kid to face in everyday life: what is true and valuable friendship? How to be accepted by others while staying true ourselves? Is it worth to sacrifice one thing to get another thing? How to speak up for ourselves? The culture angle makes the story more charming and provoking, it’s often frustrating for kids to fit into a new environment and being afraid of rejection. The story starts from Yoon’s coming birthday. All she wants for a birthday gift from her mom is a jump rope – jump rope is a popular game in school so she can play with the other girls. Instead, Yoon’s mother gives her a Korean storybook and a jade bracelet with “Shining Wisdom” engraved in Korean, that once belonged to her grandmother. The next day at school, an older girl invites Yoon to teach her to play jump rope, but for exchange, she wants to wear the jade bracelet. Yoon reluctantly borrows her the bracelet. However, when Yoon tries to get her bracelet back, the girl claims it belongs to her and refuses to return the bracelet. Yoon uses the lessons learned in the folktale from the storybook and her “Shining Wisdom” helps figure out a way to retrieve the precious jade bracelet. This book is an emotional, colorful, vibrant experience. Swiatkowska’s illustrations are full of thickly applied large textured strokes, with backgrounds of single colors – bold reds, muted olives, aero blues, and cadet grays, together giving the story a retro edge. 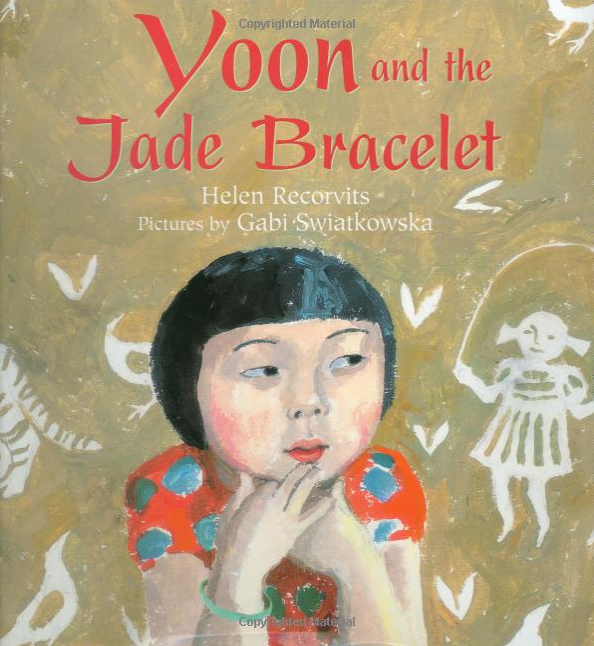 Jun11June 11, 2014 • By Helen H. Wu • This entry was posted in Book Review and tagged Book Review, Children's Book, Gabi Swiatkowska, Helen Recorvits, Korean, Picture Book, Yoon and the Jade Bracelet. Bookmark the permalink.